The 2018 growing season in West Texas was a perfect opportunity for newer Deltapine® varieties with Bollgard® 3 XtendFlex® technology to show how well they can handle the tough Texas conditions. Jerry Lewis plants DP 1646 B2XF on his farm in Wellington, Texas, because of the consistent top-end performance potential it provides. The 2018 growing season got off to a very dry start—no moisture prior to planting time, and no moisture after seed was sown. His pivot and drip-irrigated fields had trouble providing adequate moisture. 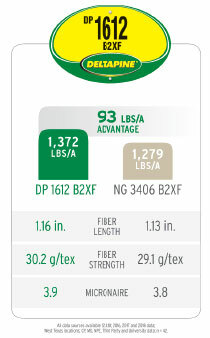 Looking for a variety with better early vigor, but packing the same high-end yield and fiber quality potential of DP 1646 B2XF, Lewis gave DP 1820 B3XF a try on two of his fields in 2018. Throughout the growing season, Lewis thought things were off to a bad start and predicted the results would be average at best. However, farming is full of surprises. 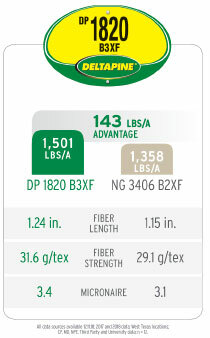 “One irrigated field planted to DP 1820 B3XF averaged 2,403 pounds per acre,” Lewis reported. The second field, after he went back to harvest the rest of the cotton following a long rain period, averaged close to 2,200 pounds per acre. Much of his cotton received lots of rainfall after bolls had opened up, causing color and leaf grades to take a hit. 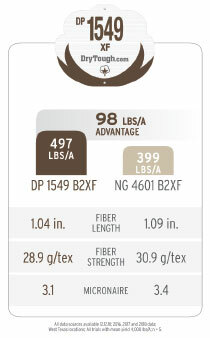 The rest of the fiber qualities in his DP 1820 B3XF were outstanding. Lewis found DP 1820 B3XF to be easier to manage with plant growth regulators than DP 1646 B2XF. On the field that averaged 2,403 pounds per acre, he felt he managed growth well and defoliated at the right time. The field stripped clean at harvest. DP 1820 B3XF. He says the grower had to spray his cotton for worms, but he never had to spray the variety with Bollgard 3 technology. Lewis said he is back to getting good control of weeds in his fields with the Roundup Ready® Xtend Crop System for cotton. He saw few escapes in 2018, and he never had to hire a hand-weeding crew to clean up a field. After some consultation with other growers, Lewis has formulated a plan for 2019. He will plant DP 1646 B2XF under pivots and water it until it comes up. He plans to plant DP 1820 B3XF on his drip-irrigated fields, where it had no issues with emergence in 2018. DP 1845 B3XF in 2018 on a 60-acre drip-irrigated field on his farm near Garden City. He planted an additional 400 acres to DP 1646 B2XF, his standard variety. Although some of the cotton experienced hail and much of it received upwards of 10 inches of rainfall during harvest time, the end results were still impressive. 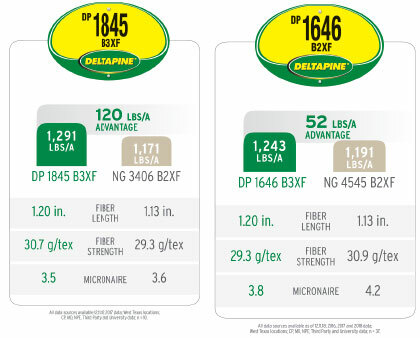 Matchek found DP 1845 B3XF to be easy to manage with PGRs, making three applications in his DP 1646 B2XF and only one in his DP 1845 B3XF. He says DP 1845 B3XF was tight in the bur. Farming in the center of the Texas Panhandle near Groom, Dustin Babcock has a tight window in which to make a cotton crop during most seasons. The 2018 planting season began in early May with dry, hot and windy conditions. His center pivots had trouble keeping enough moisture in the ground. In those types of conditions, Babcock needs varieties that emerge quickly and grow into a stand, and DP 1612 B2XF hits the mark. It was a tough, dry, early start to the 2018 season, and then fall also came early. DP 1612 B2XF was the first variety on his farm to reach harvest time, finishing 10 days sooner than the other products planted. He stripped one field that averaged 3.8 bales per acre. Another circle ginned out at 4.1 bales per acre. After seeing DP 1822 XF in his 2017 Deltapine NPE plots, Northern High Plains grower Robbie Harkey decided to plant it on his fields with weaker irrigation capacity. The 2018 growing season turned out to be a tough one, with extreme drought and heat throughout the spring and summer; it was one of the driest summers in years. Dryland cotton never had a chance, and many of Harkey’s center-pivot fields with limited irrigation capacity had trouble keeping enough moisture on the cotton. At harvest time, rain fell and fell, and then it turned to snow later in the fall. Through it all, DP 1822 XF showed solid performance and proved to be a tough variety in those challenging West Texas conditions. 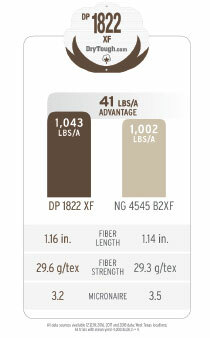 In 2018, DP 1822 XF averaged 750 to 800 pounds per acre for Harkey in fields with very limited moisture. Despite the rainfall on his open cotton, he felt the variety held its lint well. The bales went into the loan at 54.0 to 54.5 cents. He says the maturity on DP 1822 XF fits his growing region well, and he plans to plant it again in 2019. When the only cotton that grows into a harvestable stand was planted in fields with adequate moisture, you know it was a tough season. That’s the kind of season 2018 was for Jody Yates, who farms in Tarzan 100 miles south of Lubbock, Texas. Dryland fields never caught a rain, and center-pivot circles struggled to keep up. When time came to strip cotton planted on irrigated fields, harvesters could not move into the fields due to rain. Yates planted DP 1549 B2XF for the first time on his farm in 2018. He was impressed with the variety’s performance on his irrigated fields in the tough 2018 growing season. DP 1549 B2XF was particularly impressive to Yates given its ability to withstand the stress caused by high temperatures and little moisture. 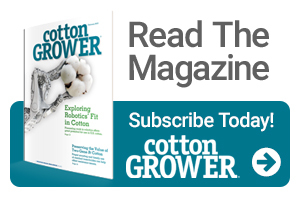 When it got to the triple-digit-degree days of July and August, the center pivots had trouble keeping the cotton adequately watered. The Southern High Plains is an arid environment. A typical season consists of 14 inches of rainfall, with most of it happening within the growing window of May through August. One rain event a month is ideal. In 2018, practically all of the rainfall occurred during harvest time, causing color issues and defoliation problems, which led to bad leaf grades. Staple, micronaire and strength on DP 1549 B2XF during this tough season were good, according to Yates.